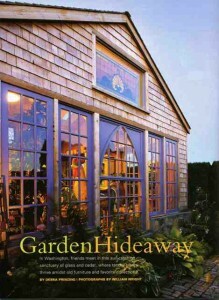 STYLISH SHEDS AND ELEGANT HIDEAWAYS: “A charming, happy, very pretty book full of ideas for building, furnishing, and enjoying your backyard shed or writing den.” — Old House Interiors review, July 2009. 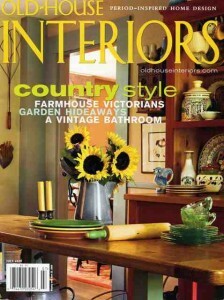 My Stylish Shed partner, the very talented Bill Wright, is a frequent contributor to Old House Interiors magazine. His photographs of luscious historic interiors and architecture are always a treat for the eyes. 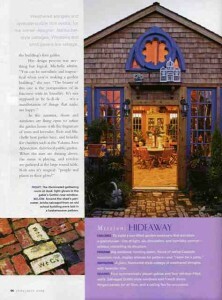 So when we learned recently that editor Patricia Poore planned to feature Stylish Sheds and Elegant Hideaways in the magazine’s July 2009 issue, Bill and I were thrilled. Patty decided to excerpt a chapter from Stylish Sheds, one about Michelle and Rob Wyles’s dreamy garden shed in Eastern Washington. GARDEN HIDEAWAY: In Washington, friends meet in this sun-catching sanctuary of glass and cedar, where tended plants thrive amidst old furniture and favorite collections. More summer cottage than glass house, this hideaway in Washington State is the centerpiece of what Michelle Wyles calls her “farmer’s wife’s vegetable garden.” It functions not only as a greenhouse, but also a place for collectibles and friendly gatherings. Two Gothic windows, which Michelle and her husband Rob hauled home from Hayden, Idaho, are bracketed by fifteen-light French doors installed as windows. 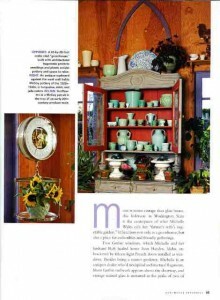 Besides being a master gardener, Michelle is an antiques dealer who’d stockpiled architectural fragments. More Gothic millwork appears above a doorway, and vintage stained glass is mounted at the peaks of two of the building’s four gables. Her design process was anything but logical, Michelle admits. “You can be unrealistic and impractical when you’re making a garden building,” she says. In the summer, doors and windows are flung open to infuse the garden house with the fragrance of roses and lavender. Rob and Michelle host parties here, and benefits for charities such as the Yakima Area Arboretum, their local public garden. Challenge: To build a sun-filled garden sanctuary that emulates a greenhouse – lots of light, air, circulation, and humidity control – without mimicking its structure. Inspiration: A plain, Nantucket-style cottage of weathered shingles with lavender trim. Design features: Four symmetrically placed gables and four window-filled walls. Salvaged Gothic-style windows and French doors. Hinged panels for air flow, and a ceiling fan for circulation. “A room of one’s own” doesn’t have to be in the house. Backyard structures sometimes bear no resemblance to the cobwebby garden sheds of suburbs past; today people are using them as studios, writing rooms, playhouses, dining pavilions – hideaways of all sorts. Look for lace curtains and window boxes, and cedar shingles instead of corrugated walls. Even toolsheds, of course, can be artistic. This entry was posted on Saturday, June 13th, 2009 at 7:41 am	and is filed under Architecture, Book reviews, Creativity, Entertainment, interior design, Landscape Design, Plants, Shed Glossary, Sheds & Havens, Writing. You can follow any responses to this entry through the RSS 2.0 feed. You can leave a response, or trackback from your own site. I’ve got to stop reading these articles! I want every one of these sheds and have room for just one. STOP! Great story! Locally ( Raleigh, NC) we use Shed Depot for our storage shed needs. They hand build everything. Great company great people. Very nice design. It’s really hard to maintain the beauty of an old place and making it beautiful is also a different story. So, doing this both really amazes me. Thanks for sharing.